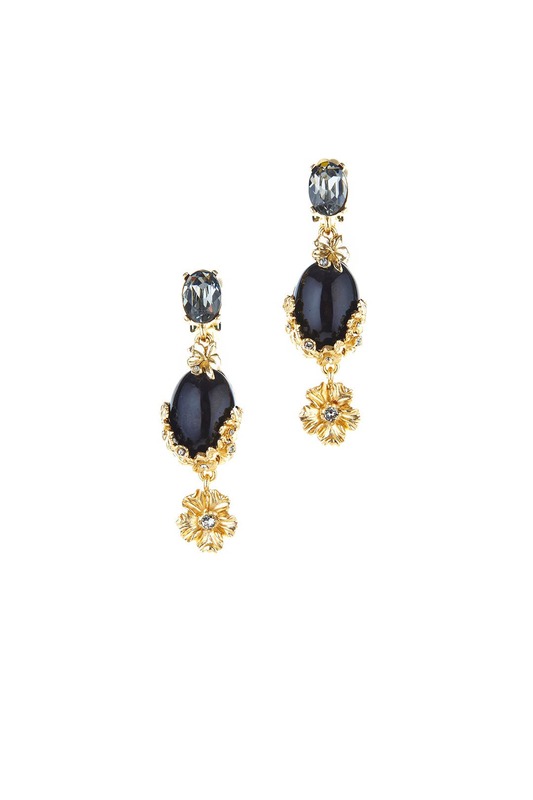 Make a statement with these floral Oscar de la Renta earrings. 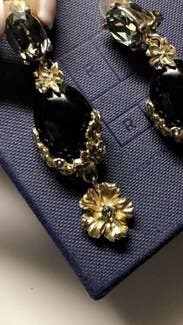 Black and gold drop earrings with a mixed motif of resin floral cabochons, gilded floral clusters, and Swarovski crystals set in gold-plated pewter. Clip backs with comfort pads. 2.75" long. The earrings are gorgeous but after 30 minutes or so, my ears started hurting since it was pinching so hard. Also, it's VERY heavy and since I'm not used to it, I took it off early in the night. That's obviously a personal issue though; otherwise it really is gorgeous and matched my long black gown! Perfect with an updo-compliments all night! I wish I had a good picture of these on because they're amazing and so different from typical statement earring! Included this picture because they were a little larger than I expected. Very secure in-spite of being heavy and clip ons. I wore these with a black off the shoulder jumpsuit and my hair pulled back. It was a really great look that added just a little bit of extra. I would definitely rent these again. They are clip-on so be aware of that. I got these as a backup after the original pair I rented were no longer available. I was nervous about them being clip ons but I didn't find them to be too uncomfortable for just one evening. 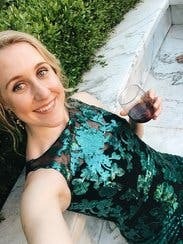 Really dressed up my LBD! These were clip on style, gorgeous quality earrings. They were the cherry on top of my ensemble. I absolutely loved hear earrings! 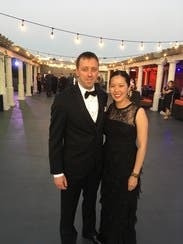 They were stunning with the Marchessa Notte dress I rented. I was worried about the being too heavy but they were perfect. I haven't worn clip on earrings since I was 12, but these were fine. By the end of the night my ears felt pinched, but not horribly so. Wood definitely rent again! 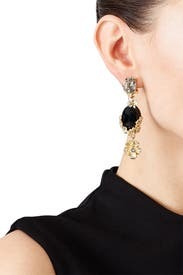 Loved the earrings but recommend for shorter time periods because they are very heavy. Beautiful classy drop earrings. They are on the large side; but, if want to impress and make a statement, this is a sure choice. Don't have my ears pierced! Went to a fancy party, these were great! They were actually quite comfortable for how big and heavy they look! Loved these!! A bit heavy & they are clip on! Loved these!! 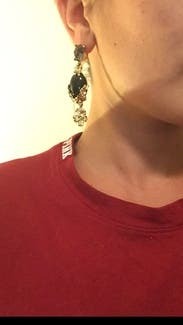 A bit heavy & they are clip on, but I was able to get a cheap-y pair of super small gold studs from H&M and finagled them to be for pierced ears through the back of the clip on! You HAVE to get the ring to match too! These were amazing clip ons! Stunning, hang low and a bit heavy but worth it! The most gorgeous pair of earrings. I wore a v-neck dress, and I have medium/long hair dark brown hair. The gold with the blue/grey stone just worked beautifully with the dress, at first I thought that that the black stone would be hidden with my dark hair, but quite the contrary, the gold rims made it even stand out more. It was definitely a modern/vintage kinda jewelry that had a timeless essence to it.